"It's the first single He let me write since my stroke," said Rev. Dr. Stefanie R. Minatee, giving God the credit for bringing her back from a stroke that left her in bed for almost a year. 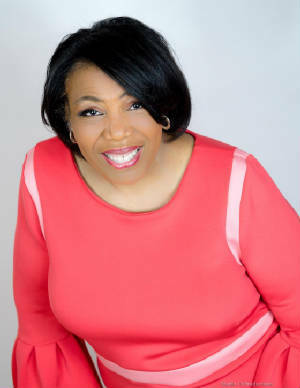 The single she is referring to is titled "It's All About You," recorded and released to mark 20 years of being the founder and artistic director of the Grammy Award winning Jubilation Gospel Choir of the New Jersey Performing Arts Center (NJPAC). "I have been in music since I was a young girl. I grew up in Mt. Zion, Sara Vaughn's church. I joined First Baptist Church, where Queen Latifah was at. He (the Pastor) allowed me to direct the adult choir." And as they say, ‘The rest is history." Minatee earned a Bachelor Degree in Music Performance/Music Education from Kean University and a Masters and Doctorate in Theology from Drew University. In 2002 she was ordained a minister. It was also in 2002 that she performed with the Jubilation Choir during the iconic Ray Charles' tour of Japan. However, before that collaboration with Ray, Dr. Stef Minatee was approached by the CEO of the New Jersey Performing Arts Center, Larry Goldman, and her uncle Councilman and Civil Rights Activist Donald K. Tucker to create a choir for NJPAC. She took on the task that currently boasts over 300 members in over 25 different cities, of which Queen Latifah's mother Rita was a "charter" member. The choir, called Rev. Dr. Stef and Jubilation, was featured on Queen Latifah's album "Oh Happy Day: An All-Star Music Celebration," which received a Grammy Award win. "My uncle was Councilman and they were building an arts center," she recalled for me. "My uncle spoke to me about doing some work. He said, ‘whatever you can do to help.' So I worked after school with the choir." Dr. Minatee has served over 30 years teaching music education in New Jersey's public schools. She also serves as minister at the Community Baptist Church in Englewood, NJ. The Jubilation Gospel Choir offers music scholarships and has collaborated with Gospel as well as secular artists, such as Hip-Hop artist Queen Latifah. When I asked how she was able to get the Hip-Hop Queen to collaborate with her, Rev. Dr. Stef said, "Dana, also known as Queen Latifah, was a member of the first Baptist Church. I asked her if she new any Gospel songs, She said she knew only one....I called her up to sing the one Gospel song she knew, a Harkins song, and the rest is history." That is true. Who knew iconic Rapper Queen Latifah had a voice like an angel! From there Queen not only started singing, she released a full album. Aside from being featured on the Queen Latifah's project, Rev. Dr. Stef and Jubilation sang with her on the single "Spirit" at the US Tennis Opening. They have also collaborated with Shirley Caesar, Isaac Hayes, Dionne Warwick and Kenny Logins. Rev. Dr. Stef and Jubilation, which has released six albums, has also performed on stage with Albertina Walker, Kurt Curr and Donnie McClukin. "(Spreading the Gospel) It's needed," Rev. Dr. Stef said about acknowledging the power of God. When we were talking about her stroke, which started with a headache and ended with her not being able to move, she said, "God saved my life. I'm so grateful He allowed me to live. All I can do is spread the word." The latest project of the trio Jazz Funk Soul titled "Life and Times" (Shanachie) soars on the wings provided by Grammy Award winning Jeff Lorber on piano/keyboards, Grammy nominated Everette Harp on sax and new comer Grammy nominated Paul Jackson, Jr. on lead/rhythm guitar. The project is dedicated to the memory of the Jazz Funk Soul founder multi-Grammy Award winning guitarist Chuck Loeb. Loeb, Harp and Lorber toured so much together they decided to form a group in 2014. "Life and Times" is the trio's third album release together and their first without Chuck. "Life and Times" also features on the album David Mann on sax, Michael White and Gary Novak on drums, Alex Al and Rickey Minor on bass and Lenny Castro on percussion. Jeff Lorber is also a producer who has worked for such iconic musicians as Dave Koz and Kenny G. He has his own band, Jeff Lorber Fusion, which scored a Grammy Award win for their 2014 album "Prototype." Everette Harp's unique saxophone playing combines Jazz, R&B, Funk and Pop. He has collaborated with such living legends as Chaka Khan, Anita Baker and Patti LaBelle. His most recent solo album is titled "First Love." Paul Jackson, Jr. is a living legend who has recorded with such mega icons as Whitney Houston, Barbra Streisand, Michael Jackson and Quincy Jones. His unique style of playing the guitar is also heard on the soundtracks of many movies, such as "Zootopia."